Maho Beach on the island of Sint Maarten (St. Martin) is one of the world’s most famous locations for plane spotting, an idyllic locale where tourists can stand on the beach just off the end of the runway and practically touch the planes as they come for a landing at Princess Julianna Airport. 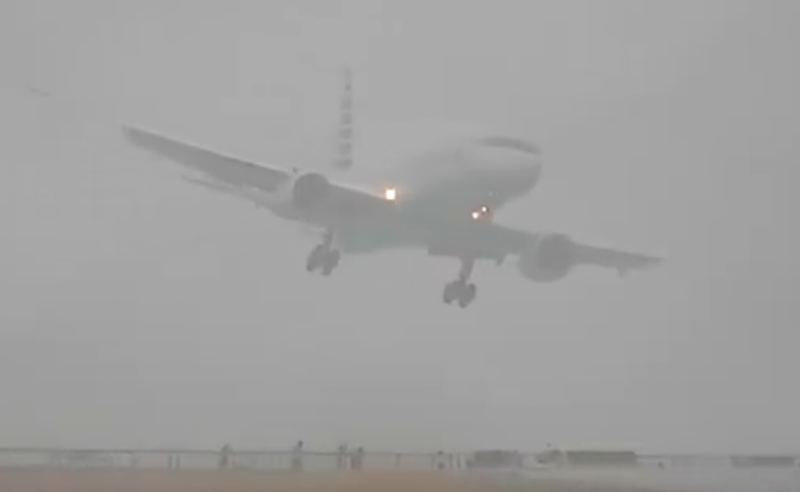 But it’s not always beach weather in the Caribbean, and conditions can get truly foul, as the crew of this American Airlines Boeing 757 found out while trying to land in a rainstorm. Everything is going reasonably well, right up to the point where it’s not. Struck by crosswind, the left wing dips dangerously and the airliner seems to head for the ground, but a quick reaction from the crew, and the extraordinary power of the 757, avert a potential disaster. The 757 has always been a hot rod, and while passengers may have complained about how long it takes to cycle through the long narrow cabin, pilots have praised its performance. In fact, back in 1991, a 757 took off from Gonggar Airport in Tibet at an elevation of 11,621 and surrounded by 16,000-foot peaks, circled, and landed, all powered by a single engine. Boeing stopped production of the 757 back in 2004 as sales of the big narrow-body were dwindling and Boeing chose to focus on building more of their best-selling 737s. Fifteen years later, with no new airliner in sight and with Boeing embroiled in problems with its 737 MAX line, the company may be regretting that decision. You can find more stories about aviation, aviators and airplanes at Wingspan.